Over the last year, SDHF has worked to support bills and measures that would improve the lives of San Diegans. Below are a few examples of we have supported in 2018 passed. 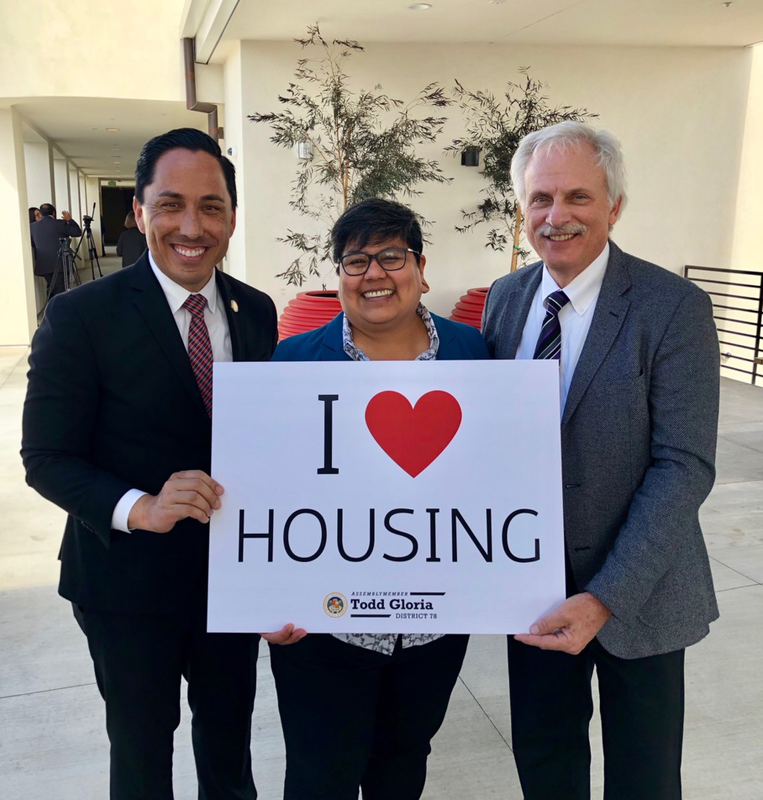 The San Diego Housing Federation was an early endorser for Propositions 1 and 2 on the November 2018 ballot, which together raise $6 billion for affordable housing, veterans home loans, and homeless prevention housing. To learn more about these measures, visit the pages for the Veterans and Affordable Housing Act and No Place Like Home. AB 2162 expedites the process for approving construction of permanent supportive housing. In March, the San Francisco Chronicle editorial board weighed in on this legislation with a headline that read, “California can’t afford neighborhood opposition to homeless housing.” We couldn’t agree more and are pleased to see this bill make it through the legislature and be signed into law. AB 2372, a bill authored by hometown Assemblymember Todd Gloria, allows for local governments to adopt an optional floor area ratio bonus program. The California’s Sustainable and Affordable Housing (CASA) Act, passed the Assembly by a unanimous vote, showing that commonsense policies that increase the supply of housing while ensuring that production includes homes for low and moderate income families is something we can all get behind. SB 828 originally required cities to zone for 200 percent of project local housing need. While that element of the legislation is no longer included, some of the bill’s provisions, including allowing the state to take into account existing as well as projected future need when determining zoning allocations and setting a minimum “healthy” target vacancy rate of 5 percent, will help to strengthen and improve housing element law. (Atkins) – Building Homes and Jobs Act. Creates an ongoing source of funding for affordable home development and job creation through a fee on real estate-related document recordings. Affordable Housing and Sustainable Communities Program Cap-and-Trade Investments in Affordable Housing The Affordable Housing and Sustainable Communities Program was created in 2014 to invest revenues generated by California’s Cap and Trade auction proceeds to the creation of affordable homes in proximity to jobs and transit as a part of the state’s greenhouse gas reduction strategy. Cap and Trade is a program administered by California’s Strategic Growth Council to reduce greenhouse gas emissions. Learn more about California’s Cap-and-Trade affordable housing program. You can also learn more about the program by checking out: SGC Presentation from June 20, 2017 SDHF Roundtable CA Climate Investments Website. Information on AB 1550 and Benefits to Disadvantaged Communities AB 1550 map. Proposition 41 provides resources to help provide homes for California’s most vulnerable veterans. Following passage of Proposition 41 in June 2014, the Veterans Housing and Homelessness Prevention (VHHP) program was created to invest $600 million of existing bond funds for the creation and preservation of affordable homes with supportive services for veterans who are experiencing homeless or on the brink of becoming homeless. The program is administered jointly by HCD, CalHFA, and CalVet to create housing opportunities for veterans and their families. Proposition 41 provides resources to help provide homes California’s most vulnerable veterans. Learn more about the program and sign up to receive updates by visiting the program’s website. Also, as part of our policy and advocacy program, SDHF is taking a local leadership role in providing feedback to the lead state agencies on the program and monitoring its design and implementation. During the public comment period, SDHF consulted with members and partners across the region and crafted a comment letter to share with HCD, CalHFA, and CalVet reaction and feedback from San Diego on the proposed guidelines for the Veterans Housing and Homelessness Prevention program. You can also learn more reviewing the presentations and materials from SDHF’s panels and workshops. 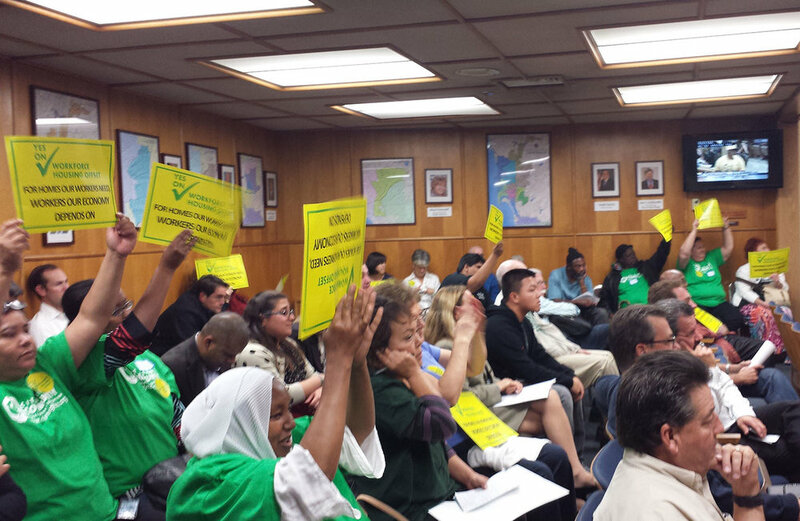 On Tuesday, October 21, 2014 after a lengthy and often contentious process, City of San Diego City Council gave final approval to a compromise on the Workforce Housing Offset. The compromise passed will see the fee restored to original levels (in 1996 the fee was cut in half as a temporary measure but never brought back) and phased in over three years. It also includes certain exemptions. San Diego Housing Federation played a critical role in addressing the main problem with the initial version of the proposal – namely, that the fee increase would sunset after three years – and supported the agreement despite concerns with some provisions. The agreement was reached thanks to the leadership of Councilmember Myrtle Cole, who worked with both sides to reach an agreeable compromise, Councilmembers Sherri Lightner and Ed Harris who championed removal of the sunset provision, and Council President Todd Gloria who docketed the item to move quickly. Parties were in agreement with the proposed doubling of the Offset, which represents a fee on current development projects that is used to create affordable homes for the lower-wage workers who will be employed at the projects built. These fees have not been increased in almost twenty years, and were, in fact, cut in half in 1996. But the initial proposal put forward to the City Council would have only maintained the increased fee for three years, while providing permanent exemptions for certain types of developments that house mostly higher-wage employees. The combination of permanent exemptions with time-limited increases would have resulted, over time, in less revenue for affordable housing when compared to the current program. With the sunset provision removed, however, the City’s Housing Trust Fund will see an annual average increase from the current $2.2 million a year to around $3.8 million annually. Over 20 years, this means an additional $32 million for affordable housing in the City! The proposal passed by the Council is very much a compromise, and includes provisions that SDHF did not favor, including: removing requirements for an annual fee increase based on construction cost (though this requirement has not been applied in two decades); including exemptions for manufacturing, warehouse and nonprofit hospitals, which reduces revenues by 15-18%; and phases in the fee increase over three years rather than all at once. Despite concerns with these provisions, SDHF believes the removal of the sunset provision goes much further to reflect a true compromise than previous versions of the agreement, which is what garnered our support. San Diego Housing Federation is very appreciative of the San Diego City Council for recognizing the affordable housing community’s concerns and working with the parties involved to strike an agreement that would address top concerns while allowing the issue to move to resolution. We are also appreciative of the support of our members and partners who worked to ensure a strong voice on this issue, as well as the San Diego Housing Commission and members of the ‘Jobs Coalition’ for working on this compromise.